Are you an adoptee looking for your biological parents? Maybe you’re helping an adoptee or you have someone in your family tree who was adopted. In each case, you might have tested with the various DNA companies and have a slew of results but you’re stymied with what to do next. I’m currently helping my adopted sister, Nancy, locate her biological father. Years ago I helped her find her bio mother using traditional genealogy sleuthing. This time around, with all the clues exhausted, we turned to DNA. In doing so, I’ve discovered some tips I’ll be sharing with you. 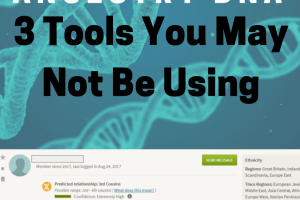 I’m using Ancestry DNA for the examples, but the other testing companies have similar tools. 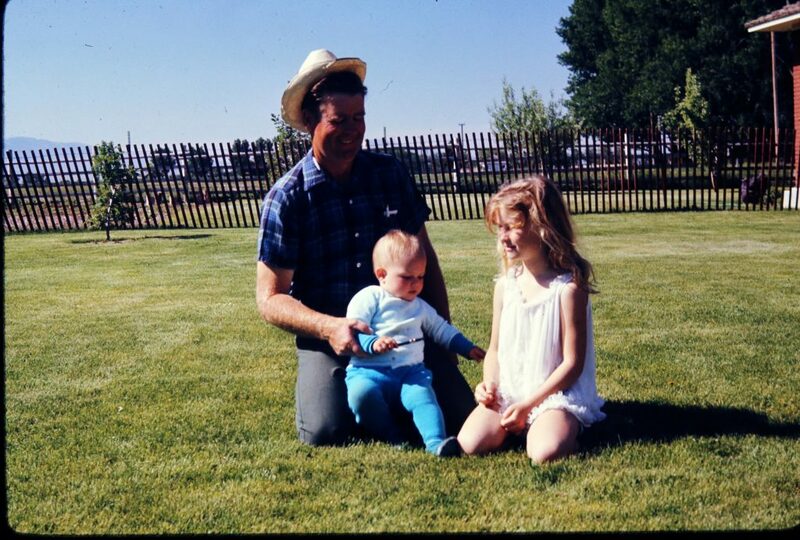 My new baby sister and me with our father. I was six years old, in first grade, when my mother came to school and excused me for the rest of the day. I was getting a baby sister! After my birth, my mother had challenges carrying a baby to full term and finally my parents decided adoption was the best option to add to our family. On the way to the hospital, we stopped at the store to get necessary supplies – diapers, bottles, blankets, and sleepers. Out of the blue our lives were about to change and we couldn’t be happier or more excited. Fast forward many years and Nancy, like many adoptees, had a desire to find her birth mom. She had questions that only her birth mother could answer. She was able to track down her birth certificate and discovered a surname and a location. With a name and place, I went to work using census records and online white pages. I narrowed the field and with a phone call or two, my sister found someone who knew something. A few weeks later she met several half siblings and her birth mother, putting to rest years of questions. Nancy’s birth mother was reluctant to reveal her birth father, so we turned to DNA testing to see if we could find him. We eagerly awaited the results from Ancestry DNA and were surprised to learn that she was 22% Finnish/Northwest Russian. Such a definitive ethnicity would definitely help in the search. When starting from square one, you’ll want to sort your matches into genetic networks – people that share DNA. To do this, start with your 2nd or 3rd cousin matches, then use the “shared matches” tool to find individuals who also share DNA. Nancy has a half brother and a half niece on her known maternal side who have also tested. I eliminated their shared matches from the pool of possible paternal line matches. If you don’t have the advantage of knowing one side of the family, you can still create genetic networks, you just won’t know whether paternal or maternal sides until the pieces start to fall into place. The screenshot below shows shared matches with “George,” Nancy’s closest 2nd or 3rd cousin. 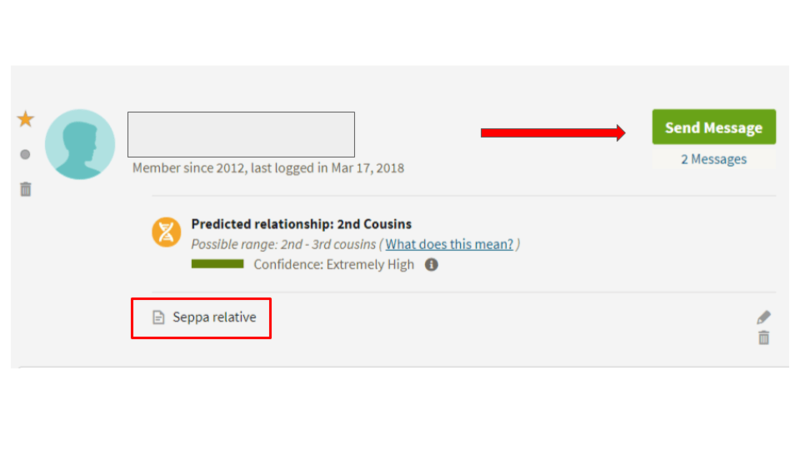 George does not share DNA with her half brother or half sister suggesting that he is on her paternal side and all of his shared matches are as well. They form a genetic network. I started a Google Sheet and listed each shared match in George’s group, then I listed any surnames associated with that match. Some individuals had full trees, some had partial trees, and most had no trees. After analyzing several matches, a few surnames began to emerge. Because of the Finnish/Northwest Russia ethnicity, the surnames showed that this genetic network had ties to that region. 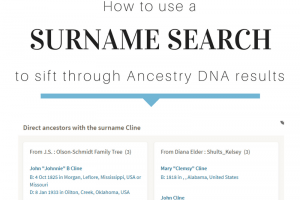 Once you’ve identified some surnames, try sending messages to your DNA matches. Let them know that you’re working on identifying a connection with them and ask if they recognize any of the surnames. Send the message straight from the Ancestry DNA member match page by clicking the green box. When sending a message, identify yourself and be as courteous as possible. Send messages to many matches. You never know who will reply and be ready to help. Some individuals might be scared off with an initial “adoptee” message, so it might be helpful to mention that fact once contact is made. Always be completely honest with your DNA matches. Nancy sent messages to many of George’s shared matches and got some replies. In the screenshot below, you’ll notice that she received two messages from George, or actually from his wife who manages his kit. She didn’t know much about the family but gave us names of other family members who could help. I added a note about this match based on the surname connection. I still don’t know exactly how Nancy and George are related, but I have found the common ancestral couple where the surname likely originated. To make sense of the genetic networks you discover, try mind mapping or charting software or even good old fashioned paper and pencil. When analyzing the network of shared matches you assembled in step one, and the clues you receive in step two, start looking for a shared ancestral couple. Make notes of how various individuals connect and include each piece of information that you discover. DNA research is a puzzle and the more pieces you have to use the better. I created a private and unsearchable family tree on Ancestry for George so I could find more connections. 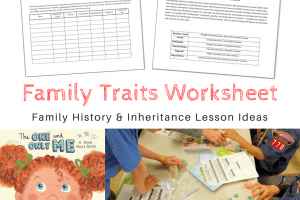 Only his father was listed on his shared tree, but as soon as I did a general search, I discovered many documents I could attach to George’s father and build the tree. Since George is a 2nd or 3rd cousin, I needed to get back to at least a great grandparent that Nancy could share. As soon as I did this, Ancestry started sending me hints and in a matter of minutes I had discovered the probable shared ancestral couple. Be sure to make your research tree on Ancestry both private and unsearchable. That way, it won’t come up in searches that other people are doing. Since the tree is a bit speculative, it wouldn’t be good for someone to copy something that is not yet proven, or get scared off because their family member is in there in a relationship that they didn’t know about. Take screenshots of the information that you find. If a biological family member gets spooked, they may take down all of their online public information that they have control over. In working with my sister’s genetic networks, I identified another ancestral couple of David Marble and Dorcas Dinsmore, the non-Finnish/Northwest Russian side. Nancy had many messages from this genetic network and the family was very confusing. I used Mind Mup, an online mind mapping program to make sense of the various family relationships. Many DNA matches came from this couple, shown in the yellow box on the far left of the screenshot below. I’m not sure how the pieces all fit together yet, but as I do more research I will continue to add to this mind map. In the challenging world of adoptee DNA research, these three steps can be repeated as new DNA matches come to light or as new information emerges. Keep good notes on each step of the process so that if you leave the search, when you come back, you’ll pick up where you left off. My sister and I are still in the midst of figuring out her puzzle. Stay tuned, as we make progress I’ll be sharing more tips and our discoveries. Best of luck in all of your DNA adventures! 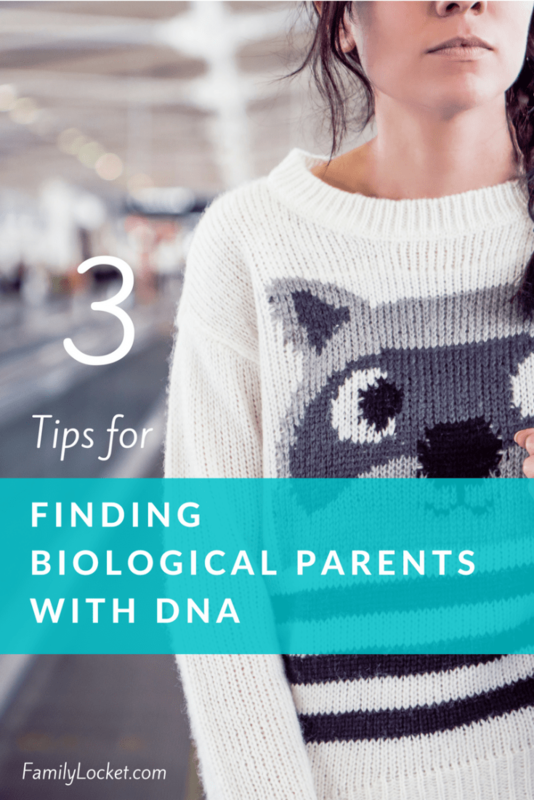 Three great tips not only for adoptees. I’m still doing the mapping in my mind. What really helps me is being able to keep the notes written for matches on AncestryDNA open at all times. I use the MedBetterDNA extension on my Chrome browser for this. 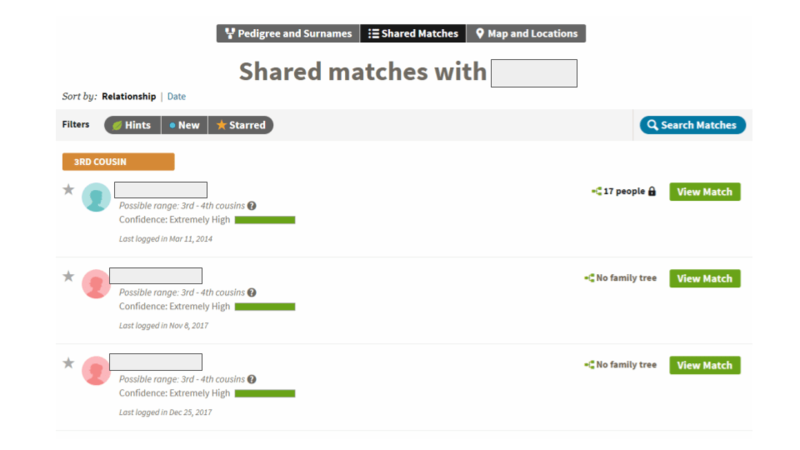 You can scroll through the list of Shared Matches (Tip 1) and see the Genetic Networks at a glance. I haven’t tried the MedBetterDNA extension yet, thanks for the reminder!